Almond milk is the healthiest summer drink. Almonds are known for innumerable health benefits from improving memory, improving skin and hair and many more. 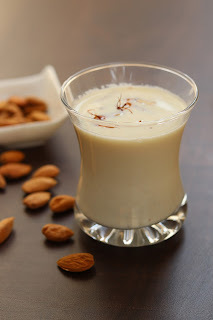 Almond milk is easy way to include almonds in daily diet. In winters milk can consumed warm and in summers chilled almond milk is very refreshing. 1. 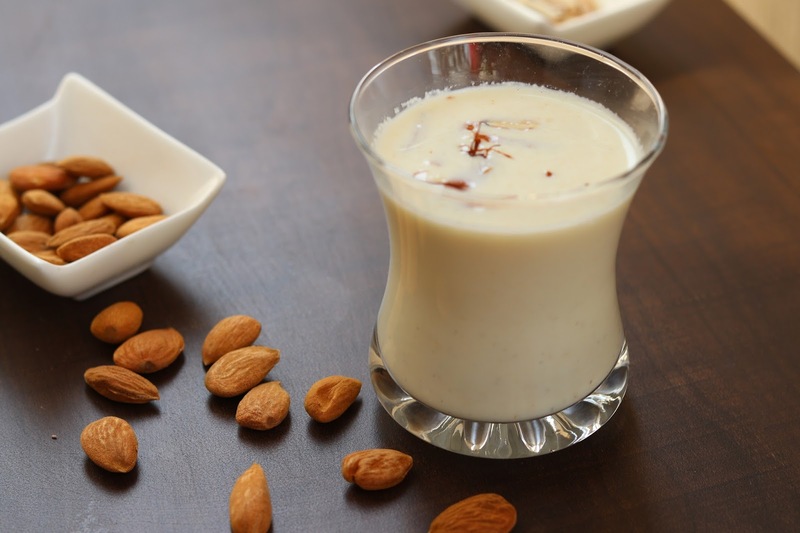 Almond paste - In a mixer jar add soaked almonds, sugar, cardamom powder, saffron soaked in warm milk along with little milk. Grind to get a almond paste. 2. Simultaneously boil milk in a pan and simmer for 5-10 min till thick. Stir in between to avoid sticking milk at base and sides of pan. 3. Add almond paste in boiled milk and simmer for 5-10 more minutes till all the flavours gets infused in milk. Switch off the flame. Cool down and keep in fridge for cooling till chilled. 4. Serve chilled almond milk garnished with almond slices and saffron strands. wow, Badam Milk recipe. I was searching for it from a week finally I found it here. thank you for sharing this healthy milkshake recipe with us.